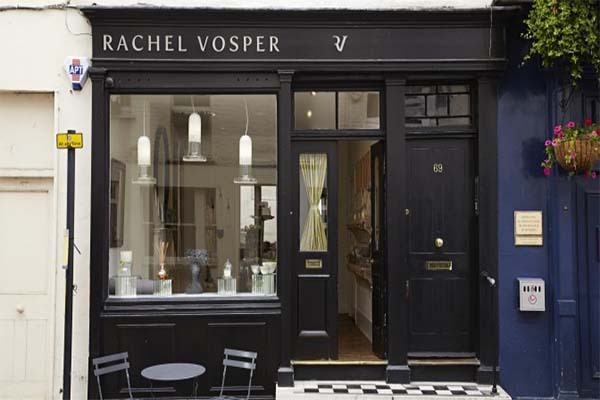 Rachel Vosper is one of the UK's leading candle chandlers. Her store is a hidden gem, located in Kinnerton Street, SW1X. Here she reveals her favourite celebrity client, her perfect home and three things she would take if stranded on a desert island. A: A serendipitous moment on a beach in Barbados. A: London’s my home. I like its diversity and the fact that I have everything on my doorstep. There’s a great sense of community in Kinnerton Street, Belgravia where I live and work, which is rare in London. I feel fortunate to be a part of that – it’s a village within the heart of the capital. A: I’m continental in my view – I rent. However my first London home was on Portland Road in Holland Park which has a similar feel to Kinnerton Street. Q: Who has been your favourite celebrity client? A: Emma Thompson because she’s charming and fun. She also returns all my handmade packaging in mint condition to reuse which I’ve always appreciated. It’s good to be so resourceful and recycle. A: I’m working on some exciting bespoke projects and fragrancing the newly-opened hotel at the Dover Street Arts Club. I’m also collaborating with Y:Co and Victor to fragrance private yachts and airplanes. Q: What new fragrances or trends are coming our way this year? A: I think there will be a boho revival with more patchouli and nag champa – although leather and smoked wood remain as popular as ever. Q: If you could create a candle for anyone, who would it be? A: I’d love to create one for French Perfumer Jean-Claude Ellena, who was born in Grasse and really lives and breathes fine fragrance. That would be an honour. I would have loved to have made a candle for my grandmother, who passed away before I started making candles. She was very creative and would have really appreciated the process. A: Music, a barbecue to cook fresh fish on the beach and a wooden barrel of Caribbean rum to offer thirsty pirates – the barrel could be turned into a boat to get home. A: My customers. They are my creative inspiration. Q: Have you had any candle-making disasters over the years? A: Thankfully none so far and I hope it remains that way. Q: Do you have any favourite interior designers or candle makers? A: Piero Fornasetti – his work is iconic and I’m fascinated by Roman Architecture. I’m a fan of the candle range, which has recycled his designs and put them in front of a contemporary audience. Q: And finally, can you describe your perfect home? A: Without doubt a Robert Adams Georgian Townhouse.